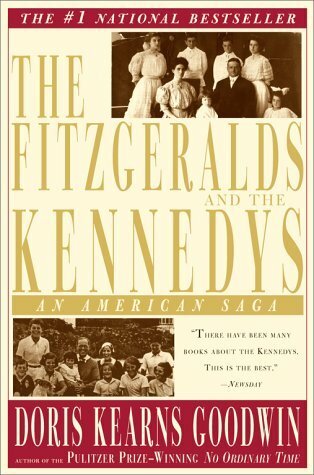 Doris Kearns Goodwin’s “The Fitzgeralds and the Kennedys: An American Saga” was published in 1987 and remains one of the most widely-read books on JFK and the Kennedy family. Goodwin is a Pulitzer Prize-winning author and presidential historian who has written about Abraham Lincoln, Franklin Roosevelt, LBJ, Teddy Roosevelt and William Taft. This 943-page tome is not a traditional biography of John F. Kennedy and covers no part of his presidency. Instead, it is an engrossing, articulate and cleverly-written narrative which chronicles much of the history of the Kennedy family, including JFK’s own life up to his presidential inauguration. Unfortunately, allegations of plagiarism have plagued this book – and Goodwin’s reputation – following a 2002 article in The Weekly Standard which exposed the author’s transgression. The book’s forty-five chapters are divided into three major sections, the first of which covers the Fitzgerald family, most notably JFK’s captivating grandfather “Honey Fitz” and his mother Rose. The second section focuses on the Kennedy family – and on Joseph P. Kennedy (JFK’s father) in particular. The third section follows JFK’s older brother and his sister Kathleen to the end of their lives and documents Kennedy’s life up to (but not beyond) his inauguration. “The Fitzgeralds and the Kennedys” is quite lengthy but wonderfully absorbing. While it occasionally feels long-winded, Goodwin’s narrative creates a vibrant texture of the times which would be imperiled by a more concise format. The book is consistently strong, but arguably at its best in its first section – the life of Honey Fitz (an enormous personality, to say the least) is spectacularly fascinating and Goodwin tells his story artfully. In fact, it is hard to imagine a dedicated biography of the man being any better than this. Other excellent moments include the colorful portrait Goodwin paints of immigrant life in mid-19th century Boston, her description of Joseph P. Kennedy’s work at a shipbuilding company during World War II and her review of his first brokerage job (which served as his initiation into the world of insider trading). In addition, Goodwin’s portrayals of many of JFK’s core family members are robust and insightful. Ironically, the book is comparatively weak revealing JFK himself. While he is frequently mentioned throughout its second half, only the last hundred or so pages are dedicated to his life. And much of the time what is covered of his life feels like a coherent summary rather than a detailed blow-by-blow. Fortunately, the best chapter on JFK (“Shooting For a Star”) provides a distillation of Kennedy’s essence in twenty-two remarkably prescient pages. Other than its relative lack of focus on JFK – which limits the degree to which the reader learns of his health issues, his notorious womanizing and his family’s efforts to hide his imperfections – Goodwin can be faulted for being too friendly to many of her subjects. While she frequently chastises Kennedy (and both of his parents) for their most glaring flaws, one frequently senses that Goodwin softened the sharpest edges to avoid offending members of the Kennedy family who witnessed the book’s publication…and who provided her with special access to more than a hundred boxes of previously unseen materials. Overall, Doris Kearns Goodwin’s “The Fitzgeralds and the Kennedys” offers a compelling (and often riveting) look at the lives of JFK and several members of his family. Given its tendency to summarize, rather than detail, important events in Kennedy’s life and its failure to analyze his character more thoroughly, this book is imperfect as an introduction to his pre-presidency. But as a second or third book on Kennedy this is an excellent choice, and anyone fascinated by the life of John F. Kennedy will find this book rewarding. Yes, this may be an excellent book, but it has been marred by the plagiarism scandal that engulfed DKG in 2002. Did revelations that she lifted a third of this from McTaggert’s book deter your enjoyment?